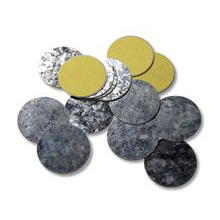 Metal Stickers are perfect for de-potted shadows, blushes, bronzers, and powders that were not meant for magnetic palettes. Just peel & stick onto the back of the pans for strong adhesion to prevent from products moving. Use a Sharpie and write the color name on the back of the metal sticker for future reference.